Bluetooth E-Cig That Acts Like a Smart Phone... Really? It was only a matter of time. "Hands-free" Bluetooth technology is everywhere - in our smart phones, cars, TVs, radios, keyboards, gaming systems... and the list goes on. 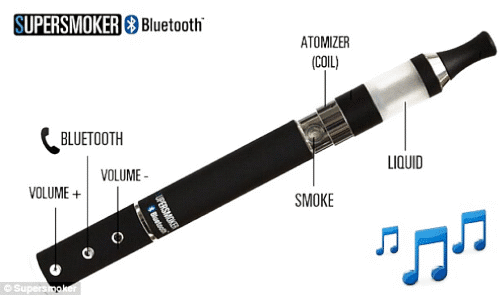 But do we really need Bluetooth tied into our electronic cigarettes? The gadget guy in me wants to love this idea, but I'm not so sure my e-cig needs to play music or if I'd feel comfortable talking to it while I'm vaping away at the local coffee shop. Netherlands-based company Supersmoker has developed the world's first electronic cigarette that connects wirelessly to smartphones and tablets. The Supersmoker Bluetooth has a built-in speaker and microphone, and when connected to your Bluetooth-enabled device it can be used like a telephone and even streams music. Play your favorite music from your telephone playlist or via online music services such as Spotify or Pandora. Every application that allows you to play music or sound can be used with the Supersmoker Bluetooth. Just press play and the sound is emitted via a built-in microphone on the back of the battery. You can regulate the volume using the [+] and [-] buttons. If you receive a call while you're listening, the music will automatically stop so you can answer. Once you finish your call, the music will continue. To make a phone call, press the middle button - holding the speaker to your ear and the microphone to your mouth. You can also talk hands-free when the device is hanging on the supplied key-cord.